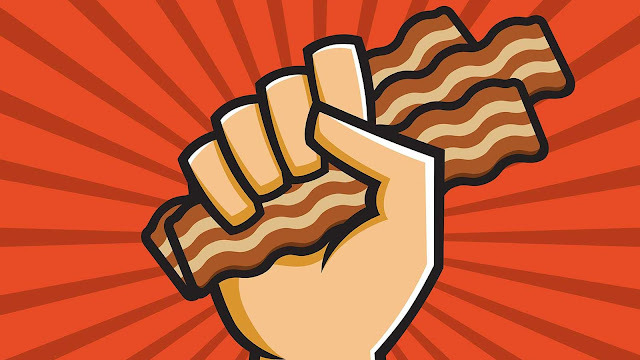 Bacon -- it's the future, man! In the year 2020 we will all get our food by jumping on counters at fast food restaurants and yelling. What a utopian wonderworld that will be! We know this thanks to the helpful efforts of a man from that far-distant time with the strange futuristic name of Dante Rashad Anderson, who came back to show us how it will be done. His first attempt to demonstrate the future occurred at an Oklahoma City Carl's Jr., but they did not understand his ways and ejected him. Undeterred, the time traveler walked across the street to Arby's, where the patrons were slightly more enlightened and allowed his demonstration to proceed after he shoved the manager up against a wall. After the obligatory yelling, the visitor grabbed a fist full of bacon and chicken, thanked them all for their kind attention by breaking a window, and left. Karate-kicking random cars as he walked down the street (possibly an obscure greeting gesture from his time), the man beyond time was found passed out at a taco restaurant due to the strain of passing through the Time Vortex without a TARDIS. Oklahoma police were skeptical at first of the man's description of the future until they remembered that Donald Trump will have been President for 3 years by then. Hence, all bets are off.